Remington has gone all out in celebrating their 200th anniversary, and this 200th Anniversary Limited Edition 870 Wingmaster is one of the exclusive models limited to a total production run of 2016. The 870 200th Limited Edition is a 12 gauge, 26 inch barrel, weighs 7.5 pounds on the nose, with a trigger that breaks at about 5 pounds. The 870 200th comes well-presented, fully assembled except for the magazine limiter, in a box that is elaborately printed on the inside, with a gunsock on the gun, surrounded by generous padding. This 870 is simply stunning, with gold engraving on the receiver, beautiful high grade walnut that Remington calls their C Grade, with their classic Fleur de Lis checkering. The checkering is more extensive than you may have seen, for there is a Fleur de Lis on the top of the buttstock where it meets the back of the receiver. The barrel has a gold ring near the muzzle, the trigger is gold-plated, and the 200th Anniversary grip cap is a sculpted 24-karat gold inlay. This limited production model has an MSRP of $1499; more details can be found at http://www.remington.com/shotguns/pump-action/model-870/model-870-200th-ann-ltd-ed . As with all Remington firearms manufactured in 2106 onward, the 870 Limited comes with a lifetime written warranty. The Remington 870, introduced in 1951, has gone on to become the most wildly popular shotgun in the history of the world. By April of 2008, 10 million were produced and by now, something like 12,000,000 have sold. When Remington wants to, they can make truly beautiful shotguns, and with this model they obviously wanted to. 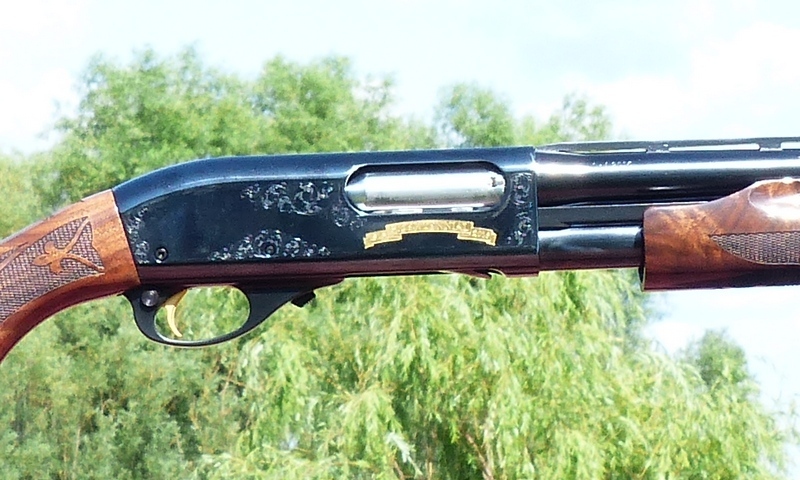 Most of the repeating shotguns today have gone away from steel receivers. It is unfortunate, on a couple of levels, for engraving invariably really pops out crisply when applied to steel. Remington was one of the last of the major manufacturers to add screw-chokes to their shotguns: the Remchoke system was added to the 870 12 gauge (and the 1100 12 gauge) fairly recently, in 1986. One of the benefits of not being first on the block with choke tubes is that you don't have to offer eighteen different types of threads and lengths to get it right. It has always been more than a pleasure (an irritant) when, in struggling to sell a new choke tube, the same model is introduced with yet another meaningless choke tube style, making the drawer full of choke tubes you already have worthless. The 870 Wingmaster 200th Limited has the same Remchoke system that has been service for thirty years. Premium, finished wood sets for pumps and autoloaders don't come cheap at all. For those that enjoy and appreciate fine walnut, yes, you certainly can spend more than the price of this entire gun for just a finished wood set, such are the times in which we live. 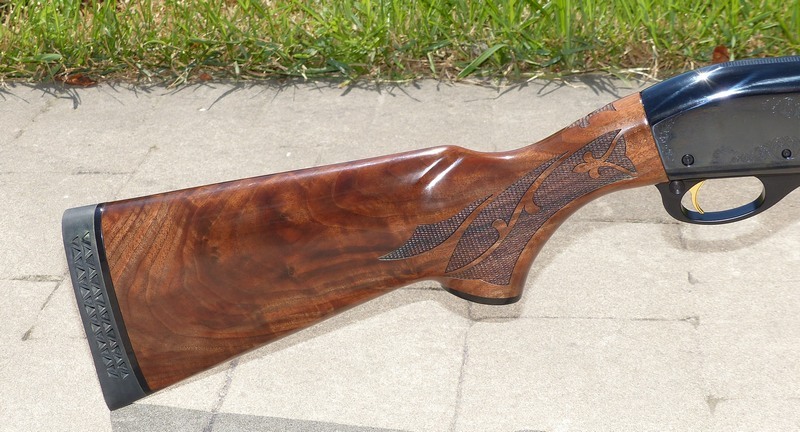 There is invariably a bit of sticker shock out there, for the fellow that is looking at a $2500 O/U, for example, and wanting well-figured wood, checks out the EELL version and is jolted to discover the same gun is now $7500. That may be a bit of an extreme example, but when you can buy five 200th Anniversary Wingmasters for that and have cash left over, it is food for thought. The 870 Wingmaster Limited comes with the common set of three choke tubes, but like the Remington V3 autoloader, the “Full” choke tube is made from a more expensive alloy and is suitable for both steel and lead. It is marked that way, right on the tube. I'm glad to see that this specific model comes with a 26 inch barrel, for generally 26 inch barreled repeaters (and sometimes 24 inch) are better balanced and better handling than their longer-barrel counterparts.